The temple of Demeter from the Valley of the Temples in Italy, oriented to face the full moon above the acropolis from the back side constructed esplanade. A new research, analysing orientation patterns of ancient Greek temples, has presented its findings after a survey of the Valley of the Temples UNESCO site in Italy. 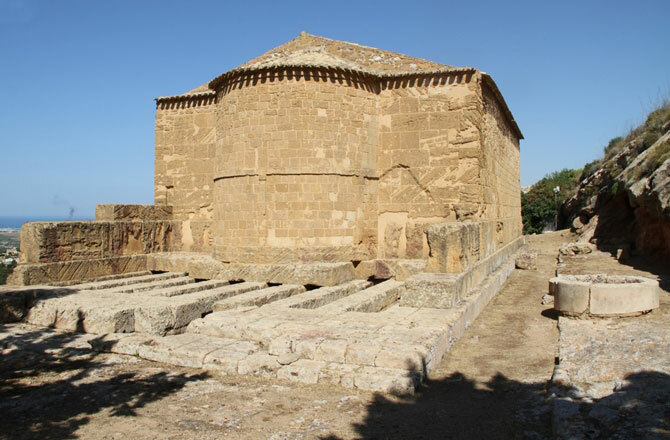 According to the high precision survey the 2,500-year-old temples just outside Agrigento, in the Valley of the Temples, were not aligned only to the rising sun as was generally thought. According to Giulio Magli, professor of archaeoastronomy at Milan’s Polytechnic University, architects of the temples took into consideration various factors, including astronomy, urban layout and morphological aspects of the terrain, religious connections, following symbolical or practical reasoning for each temple. Magli, with Robert Hannah at the University of Waikato, New Zealand, and Andrea Orlando at the Catania Astrophysical Observatory carried out a research on the subject publishing their findings at the Cornel University web site, arXiv.org. The research was funded by the Ente Parco della Valle dei Templi. Akragas, later called Agrigento, was one of the most important Greek colonies in Sicily. The Valley of the Temples includes the remains of 10 Doric temples dedicated to Greek gods, goddesses and heroes. Scholars had been debating on the temples’ orientation since the end of the 19th century, not being able to conclude whether they were aligned with astronomic events or the place of the sun or moon on specific days of the year. According to the study by Magli and his colleagues at least four of the temples in the valley are orientated according to the town’s grid, following a general rule of their facade facing the east. One of the shrines, the temple of Juno, was aligned to the stars in the Delphinus constellation. The temple of Zeus, on the other hand, was orientated in accordance with the street grid. The temple of Demeter and Persephone is rather unique in that respect and highly essential yet previously unpublished. Demeter, goddess of nature, and her daughter Persephone, were key figures in the Eleusinian mysteries. According to the myth, Persephone was abducted by Hades and taken to the underworld. The Eleusinian mysteries would celebrate the reunion of Persephone with her mother in a cycle with three phases, descent, search, and ascent. The temple is preceded by a fountain sanctuary where votive deposits were found, including a Persephone statuette, connecting it to secret religious rites. The relationship between those rites and astronomy is not yet established, but the orientation of the temple in connection to the moon is possible according to the research. The temple comprises two small circular altars in a corridor between the rock cut to the north and the side of the temple. One of the altars has a central well, where offering remains have been found. At the back of the temple an esplanade was constructed with retaining walls on one side and rock leveling on the other. The space in front of the temple was not large enough for worhsipers to assemble, Magli and his colleagues speculate that people would reach the temple in a nocturnal procession and crossed the corridor throwing offerings in the central well, gathering at the esplanade at the back. From their they would have a clear view of the full moon over the hill of the acropolis.